It is scorching here this week! 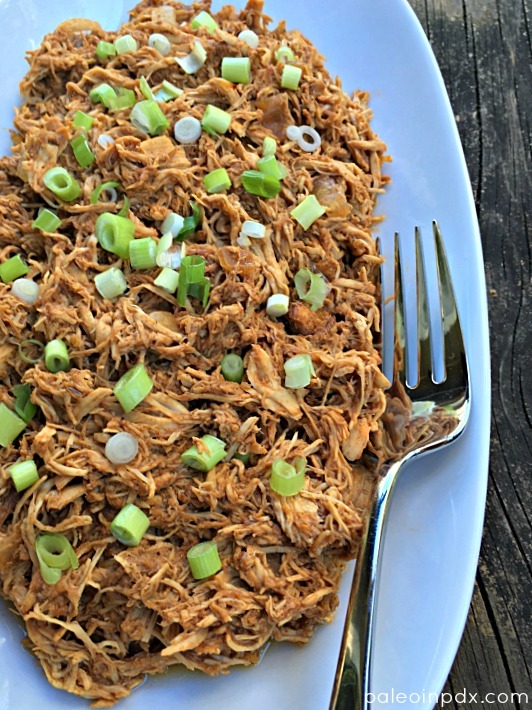 I know, kinda crazy that I’m sharing a slow cooker BBQ shredded chicken recipe, but I made this on a more normal hot day, so it was fine. Plus, slow cookers actually don’t heat up the house much and the little bit of heat it does create is worth it. Not only that, but you really can’t go wrong with barbecue shredded meat, especially in the summer! I highly recommend serving this with homemade coleslaw on the side, along with whatever else you like. The chicken and coleslaw are especially delicious with roasted sweet potatoes. In terms of the paleo barbecue sauce, you can either make my homemade recipe or opt for a paleo-friendly store-bought option like this one. Chicken breasts and paleo-friendly barbecue sauce cooked together in the slow cooker, creating this tender shredded meat. Add chicken, onion, and garlic to the bottom of the slow cooker. Season to taste with sea salt and black pepper. Add BBQ sauce and cover with lid. Cook on low for 6-7 hours or on high for 4-5. Once done, shred the chicken with two forks and stir to coat with the sauce. If the chicken seems like it needs a bit more moisture, add a little water and/or more sauce, and stir again.